A crowd of protesters set a black Venezuelan man on fire, after accusing him of theft. With the world’s attention affixed on the situations in North Korea and Iran, little mind is being paid to the ongoing crisis afflicting Venezuela, our wayward southern neighbor. Previously, I’ve reported on the dangers that doing nothing with the Venezuela situation would pose. However, some of it bears repeating. For, while Americans concern themselves with terrorism, Russian hacking, North Korean nuclear weapons, and Iranian protests, few take the time to focus on what’s going on in Latin America. Put simply, Venezuela is a failed state. Because of its failed state status, it has become a magnet for instability–the kind that tends to radiate out toward the surrounding region. So long as the United States continues ignoring the Venezuelan collapse, the problems will compound, and regional instability will increase, which will directly impact the United States, since we share a land border with that part of the world. Inflation in Venezuela is through the roof; children are starving. Just to gain things like food and toilet paper, Venezuelans are having to subject themselves to terrible indignities. Many are dying. Meanwhile, crime is rampant and the government is piling on with repression and criminal behavior of their own. The Maduro regime is intent on staying in power no matter what (when it is the Maduro regime, and the Chavismo ideology that it believes that is most responsible for the destruction of Venezuela). A refugee crisis has occurred, as Venezuelans who cannot even afford a simple meal, turn their hopes to their neighbors, and flee. As the mass exodus and chaos expands beyond Venezuela, something will have to give. Clearly, the regime of Nicólas Maduro must go. But, just as with the Iranian situation, the United States is not in a position to remove the Maduro regime by force. And, despite being directly affected by the collapse of Venezuela, countries like Brazil and Colombia are either unwilling or unable to undertake a regime change operation of their own. Without the removal of the Maduro regime, the situation will continue to worsen; the region will continue to destabilize. Thus, it behooves the United States to try to do something to mitigate the knock-on effects of the continuing collapse of Venezuela. Like something out of a zombie apocalypse film, grocery stores were the first to be totally cleared out when the country’s economy collapsed (violence erupted in the early phases of the collapse in grocery stores between people over the last bits of available food). Food is probably the most important commodity that the Venezuelan people need. The United States, along with regional partners, like Colombia and Brazil, have the capacity to remedy the situation by sending large and continuous quantities of food and other provisions to the people of Venezuela. Obviously, the Maduro regime will deny access to its territory, or it would simply seek to control the flow of Western aid into Venezuela. Yet, any humanitarian endeavor would fail if the United States allowed for the current regime in Caracas to control the flow of supplies. As we’ve seen with similar humanitarian missions, like those we undertook in Somalia in 1992-93, if those in power control the delivery of aid, the aid becomes yet another weapon that the regime will use in its war on its own people. The United States should marshal its South American allies and, together, simply flood Venezuela with food and other aid–any non-violent commodity that the people would need to survive–and keep doing it until the people’s suffering has stopped. Imagine a Berlin Airlift-type mission to deliver goods and supplies throughout the major population centers of the country. 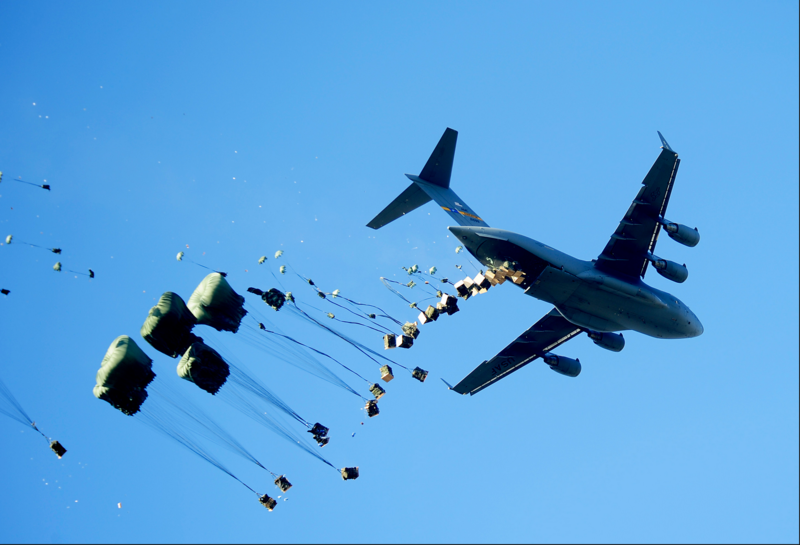 Overflights conducted by American military planes dropping supplies, or Colombian or Brazilian planes doing the same, would have an incredible effect on the political situation in Venezuela. It’s important to stress here that I am not talking about using the usual humanitarian methods (civilian agencies, such as USAID). I am specifically talking about militarizing the endeavor; daring the Venezuelan regime to shoot at American military planes dropping aid. Plus, the sight of American military planes delivering much-needed humanitarian aid throughout the country would serve larger U.S. foreign policy objectives in Venezuela. First, it would undermine the regime, by illustrating two points: a) they have no discernible control over their airspace, and b) the people would see that it was American planes and goods being dropped to them in their moment of suffering. These acts would go a long way in healing the wounds that exist between Venezuela and the United States. Second, it would stabilize the situation in Venezuela. Right now, uncontrolled migration flows and mindless aggression from Venezuela are the biggest threats to the United States and Latin America. Further, the more unstable Venezuela is, the more of a home to criminal and terrorist elements it becomes. We know that several high-ranking political and military leaders in Caracas are heavily involved in the international narcotics trade; we know that rogue states, such as Cuba and Iran, have deep ties–that are growing–with Venezuela’s corrupt government. We also know that failed states often become the home of drug cartels and terror cells. All of these things are a danger to the United States. Ceaseless refugee flows will work their way–however slowly–to the broken U.S. southwestern border, in a similar way that unfettered migration from the war-torn Middle East has been flowing unabated into Europe, destabilizing the political order there. Without a wall to contain the looming crisis, America is wide open. A wall will take time to build. In the meantime, there is much that can be done to slow or even prevent the massive refugee wave that is likely to occur any day now: public, military-backed, humanitarian aid missions deep into Venezuela. Also, as things got worse in Venezuela, the Maduro regime would undoubtedly move to antagonize its long-time rival of Colombia through military provocation, in an attempt to gin up nationalist sentiment, and restore confidence and support in his flailing regime. We’ve already seen the way that Venezuela’s government started ginning up anti-American sentiment in the last six months and the way in which they’ve opened their country up to increased Russian military presence; conducting joint drills with the Russians and purchasing an increasing array of Russian-built weapons meant to threaten American military craft and personnel. This cannot be allowed to persist. Think about it: if the United States incurred the cost and took the step of flooding the country with humanitarian aid, it would give the Venezuelan people a reprieve. Since the United States must eschew any notions of leading a regime change mission in Venezuela, the hated Maduro regime would remain in place. Meaning that once the Venezuelan people were fed and made healthy again, they would direct their ire toward the government–and there would be little that the regime could do to divert their peoples’ anger. One thing is certain, however, the United States cannot continue to allow for the cancer that is the situation in Venezuela to metastasize and spread to the surrounding region. Overnight, Latin America will go from relative peace and tranquility into a toxic miasma of violence and instability that will impact our southern border. The United States must act now. We must look to the Berlin Airlift and do what we can to send aid to the Venezuelan people in a visible way that lets them know that they are not alone and the United States is not their enemy. Venezuela’s enemy is its own leaders. If the United States fails to act, we could be facing a refugee crisis on the level of the Syrian Civil War, and we could witness the complete destabilization of Latin America–which will creep its way into our country, since we share a mostly undefended land border. While humanitarian aid may be a costly endeavor with no guarantee of success, doing nothing assures failure. Berlin Airlift. This is the kind of massive, visible, public endeavor that the United States needs to engage in to rally the Venezuelan people; put the Maduro regime on its heels; and stabilize the region.